The Penguins would get a starting caliber goaltender back int the lineup for Game 3, but it wasn't the one they might have expected back at the start of the postseason. Matt Murray returned to the lineup after the controversial decision to play him against the Flyers a week and a half ago, and Pittsburgh returned to their puck possession ways to dominate the gameplay in a 3-1 win over the Rangers. Sidney Crosby would get Pittsburgh on the board with a power play goal, Matt Cullen would give them the lead, and Kris Letang would put it to rest with an empty netter as Murray needed to stop only 16 of 17 shots to get the win. After seeing Jeff Zatkoff in net the first two games of the series, it was Matt Murray who led the Pens out onto the ice for the pregame warm up. 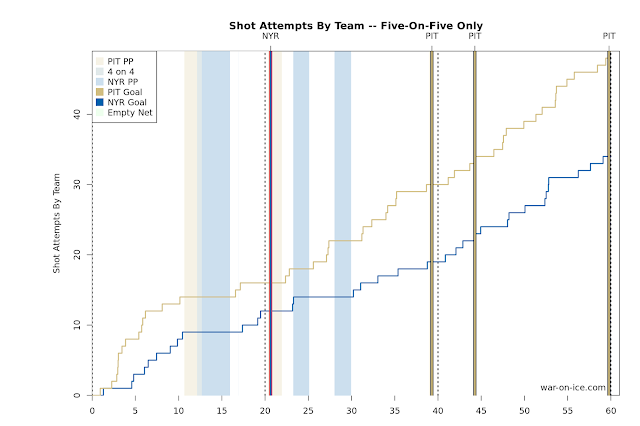 And unlike in the first two games of the series, it was a fast-paced and wide open game from the opening faceoff. The Penguins were generating a ton of pressure, and Murray was showing no signs of rust in his return to the lineup. Pittsburgh would get their first power play of the game after Marc Staal tripped Chris Kunitz as he threatened to get behind the defense on a breakaway. However, the opportunity would be cut short after Conor Sheary took a high sticking double minor in the Rangers' zone when he clipped Dominic Moore in the face after missing on the stick lift. The referees would end up missing a high sticking penalty the other way as Dan Boyle caught Kris Letang up high, and it appeared that the Rangers would go down the ice and score on the power play when Chris Kreider put a loose puck into the empty net, but Mike Sullivan would challenge the play for offsides. Upon review, J.T. Miller had clearly entered the Pittsburgh zone ahead of the puck, and the refs waved off the goal. The Rangers would still have over three minutes left on their power play, but the overturned goal gave the Pens a chance to regroup, and New York would threaten much after play resumed. The finish to the 1st period would be just as intense as the start, but it was the Rangers gaining the upper hand and the Penguins thankful for the horn to send the teams to the locker room for the first intermission. It wouldn't take long into the 2nd period for the Pens to find themselves back on the power play after Kreider was called for boarding Patric Hornqvist just 22 seconds into the period. However, it would be the Rangers, not the Penguins, who would end up taking advantage after Rick Nash sniped the far corner up top against Murray on a 2-on-1 rush. Not long after, Trevor Daley would take a roughing penalty against Mats Zuccarello in a net front scrum to give New York a chance to double their lead. The Pens would begin to ramp up pressure again, but it would be Malkin needlessly tripping Derick Brassard in the offensive zone on his way to the bench, and again New York would go on the man advantage. They'd kill off the penalty, and Pittsburgh would spend the last part of the 2nd period ramping up the pressure in ways they hadn't been able to in the first two games, but Henrik Lundqvist was up to the task and showed why New York can be such a dangerous team even with a mediocre group of skaters. With a minute remaining, Carl Hagelin would draw a holding penalty from Marc Staal, and the Penguins would look to score a goal to tie the game and give them some momentum heading into the 3rd period, and it took them just seconds to get on the board when Phil Kessel threaded an absolutely perfect pass through a mass of bodies from the left circle to Sidney Crosby on the far post for the redirection. The goal set up a big start to the 3rd period with both teams looking to get the go ahead goal, and it was a tight game in the opening minutes of the period, but Matt Cullen would race to get to a puck in front of two approaching Rangers, and he somehow got past them both to get in all alone on Lundqvist, shooting the puck five hole to give the Pens the 2-1 lead. While the Pens had trouble solving Lundqvist, the emphasis they put back on driving the play allowed them to only need to make up 1 goal instead of the 3 they needed in Game 2, and after getting the second goal it allowed them to better defend the lead by forcing New York to defend their own end. In the end, it'd be Kris Letang icing the game with an empty net goal from the red line. After Pittsburgh got thoroughly outplayed in the possession game over the course of the first two games, it was imperative for the Penguins to get back to aggressive style that got them to this point. They succeeded and then some to putting the rest the notion that New York could give them trouble driving play at 5-on-5, and they managed a score-adjusted 62.1 CF%. It was the dominating performance that became the hallmark of the Pens' season ending stretch of play, and watching Pittsburgh turn it back on after getting Murray back has to be demoralizing to New York. The teams will meet again in Game 4 at Madison Square Garden, and the Penguins will try to take a commanding 3-1 lead back with them to Pittsburgh.